Ontario has approved a plan to reduce the number of Toronto city councillors from 47 to 25 ahead of this October's election. The province's new Progressive Conservative government passed the Better Local Government Act, also known as Bill 5, on Tuesday afternoon, despite receiving no support from the opposition parties, which condemned the move as undemocratic during debates. 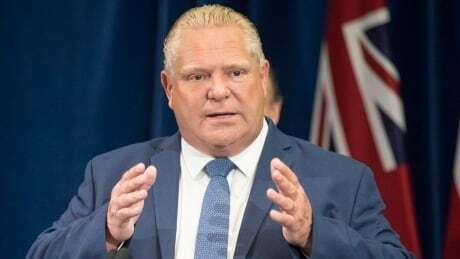 "The people want smaller government," Premier Doug Ford declared in the Ontario Legislature. "They want a city of Toronto that is functional, a city of Toronto that can build transit." Conservative MPPs cheered as the bill passed, while the other side of the legislature was silent. The legislation aligns Toronto's ward map with provincial ridings, while extending the nomination period for council candidates until Sept. 14. "The City of Toronto must run more smoothly and not be mired in bureaucracy and wastefulness," said municipal affairs minister Steve Clark during debate of the bill. "We are proposing to help the largest city in the province run like a well-oiled machine." Official Opposition and NDP Leader Andrea Horwath declared the bill "undemocratic" and said Ford was "drunk on power." She pointed out that Ford did not specifically campaign on this issue during the spring provincial election. "He didn't say a word [during the election] and now he's pretending he was talking about it all the time," said Horwath. "He hid it from the people the entire campaign." Toronto Mayor John Tory and a majority of Toronto councillors also oppose the change and are set to hold an emergency meeting in the coming days to decide whether to challenge it in court. Ford, himself a former council member, revealed his plan just weeks ago, after many candidates had already signed up to run in the Oct. 22 election. Rocco Achampong, who was set to run for council in Ward 13, Eglinton-Lawrence, is seeking an injunction to block the change. A judge is set to hear his argument on Aug. 31. The legislation also cancels planned elections for the head of council position in the regional municipalities of Muskoka, Peel, York and Niagara outside Toronto. Instead, the head of council in each region will be appointed. Those regional municipalities would be able to change that in the future, under the new legislation. The summer session at Queen's Park has now ended, with MPPs not expected back until Sept. 24.